London: The Grand Theatre, Croydon. 8 June, 1896. Darlington: Theatre Royal. 3 August, 1896. First provincial performance. Glasgow: Royalty Theatre. 7 December, 1896. There is a letter in The Era (13 June, 1896) from Buchanan complaining about one critic’s response to the play. 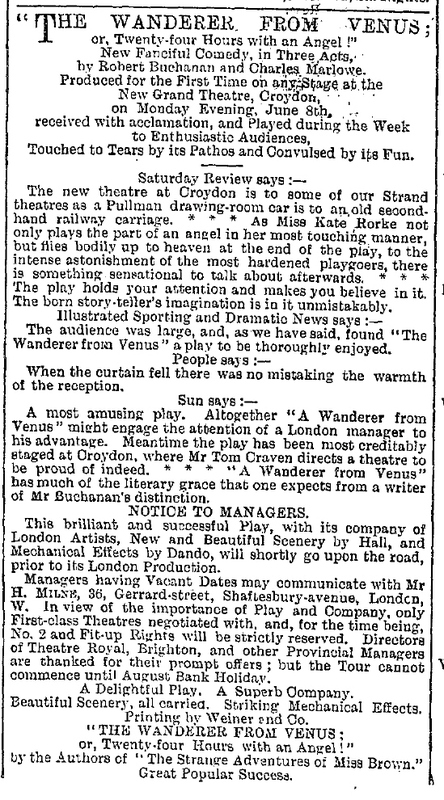 Buchanan also explained his reasons for producing the play in Croydon, rather than the West End, in ‘An Interesting Experiment’, published in The Theatre (1, July, 1896). A NEW and original play, written by Robert Buchanan and Charles Marlowe, described as a fanciful comedy of modern life, will be produced at the Grand Theatre and Opera House, Croydon, on Monday, June 8th, and will be played there during the week. The leading female character will be created by Miss Kate Rorke, who will be assisted by a company of London artists. New scenery is being prepared by Mr Hall. It will be remembered that Mr Beerbohm Tree and the Haymarket company opened the beautiful new Croydon theatre with Trilby, and the experiment was so successful that another record, the first production of an important original work there, will now be made. THE new fanciful comedy, by Messrs Robert Buchanan and Charles Marlowe, which will be produced on June 8th at the Grand Theatre, Croydon, is now in active rehearsal. Miss Kate Rorke will sustain the leading rôle, and also engaged are Miss Vera Beringer, Miss Louisa Gourlay, Mr Oswald Yorke, Mr John Beauchamp, and Mr G. W. Anson. The new scenery is being painted by Mr Hall, and the mechanical effects are being superintended by Mr Dando. MR TOM CRAVEN will produce at the new Grand Theatre and Opera House, Croydon, on Monday, a new and original fanciful comedy, written by Robert Buchanan and Charles Marlowe, entitled The Wanderer from Venus. The cast will include Miss Kate Rorke, Miss Vera Beringer, Miss Florence Leclercq, Miss Louise Gourlay, Mr G. W. Anson, Mr John Beauchamp, and Mr Oswald Yorke. Even if Mr. W. S. Gilbert had never put pen to “Pygmalion and Galatea,” and Mr. Harry Paulton had refrained from twisting the same theme to a purpose purely farcical in the three diverting acts of “Niobe,” one would have found but poor entertainment in the “fanciful comedy,” which at Croydon, last evening, saw the footlights for the first time. As it is, “The Wanderer from Venus” comes as a very faint echo of plays wherein a similar idea has been worked out to ends incomparably happier. Surely Messrs. Robert Buchanan and “Charles Marlowe,” practised writers for the stage as they are, must have been nodding when they turned their hands to such a hash of well-worn material. Dramatists make mistakes, we are well aware, and Mr. Buchanan has gone astray in his time like the rest. But he has rarely allowed his choice to fall upon a scheme quite as profitless as that which was submitted to Croydon playgoers last night. The new Galatea does not spring from a block of marble. She flutters down from the planet Venus upon a sleepy country village at the call of a foolish young gentleman who dabbles in astronomy and firmly believes in the possibility of entertaining an angel unawares. When Stella has made her appearance, clad in gauzy green raiment, she babbles in blank verse very much after the manner of Mr. Gilbert’s statuesque heroine, she innocently flings her white arms round the silly youth who has inveigled her to earth, and she even hangs upon the neck of the matter-of-fact village doctor, who regards her as a pretty lunatic. As both star-gazer and medico are betrothed to the daughters of the local vicar, it can well be imagined that a crop of lovers’ quarrels speedily spring up round the ethereal stranger who wanders at will among the gooseberry bushes in crackbrained young Somerville’s garden. There is but one way out of the difficulty. The superfluous Stella must return to the distant star whence she came; and this she finally does, to the relief of the young ladies, who no longer have reason to harbour jealous doubts of the fidelity of their respective swains. With all her art, Miss Kate Rorke could not make Stella a worthy successor to Galatea and Niobe. What the actress was able to do for the play in the way of soft utterance and gracious gesture she did right royally; while such capable artists as Miss Eva Moore, Mr. John Beauchamp, and Mr. G. W. Anson were also among those who worked for the common good. But “The Wanderer from Venus” was not to be redeemed by the sturdiest of efforts; and although a well-disposed audience greeted the damsel in a spirit of constant kindliness, it is impossible to foresee a future for “Stella,” save perhaps in the playhouses that flourish on her own planet. The Wanderer from Venus; or Twenty-four Hours with an Angel. Whatever the ultimate verdict is as to this work from the pens of these productive writers, it cannot be denied that the large and fashionable audience that assembled to give greeting to the new work was throughout most friendly, if not demonstrative. It can hardly also be denied, however, that though the authors have worked upon a theme that in other guises has already been well nigh used up. Suggestions of Pygmalion and Galatea and Niobe were on the lips of all experienced playgoers, and it is unfortunate for the present collaborators that these two works should have preceded theirs, and, moreover, should also have been infinitely better both in story and treatment. The slight ringing of the changes in making the central figure descend from the heavens, instead of taking the form of a vivified statue, matters little; the ruling idea is the same, and the story runs on similar lines. The handling of the theme, too, shows a want of decision, and it would have been much better to make the piece either broadly farcical or entirely poetic, the former for choice, as there is little doubt that the subject is one that lends itself much more to humorous than to serious treatment. On one point the authors may certainly be congratulated, and that is in the interpretation of their work, the cast being one that could not well be improved, although most of the artists cannot be said to have had any great scope for the exercise of their abilities. The play opens in the village of Moonbury, near London, where we find Claude Somerville, an ardent and enthusiastic astronomer, and John Middleton, a matter-of-fact country doctor, engaged to the two daughters of the vicar, Dr. Dullamere. After a talk of more or less worldly affairs the conversation naturally turns to astronomy and upon Claude’s fixed idea that this earth is only one of many planets that are inhabited, and that angels unawares may occasionally visit us on this sphere. The doctor pooh-poohs the notion, and enforces his conviction by material arguments, and after a short love scene with his fiancée, Dora, the young astronomer is left alone, and, after indulging in flights of fancy and meteoric rhapsodies, calls upon the planet Venus to come down. The answer is a charming visitant in the form of Stella, who, lightly clad in gauzy-green garments, flutters down from the heavens, and straightway makes innocent, yet dangerous love to the young enthusiast, at whose call she has left the realms above. In act two, the morning after, we naturally find that the presence of a young and charming “angel,” clad in diaphanous raiment, in the room of a bachelor about to become a Benedict, gives grounds for much uneasiness, and Somerville’s housekeeper is particularly forcible in her reasoning as to the undesirability of such a visitor. As, too, the charming Stella is none too constant in her innocent attentions, but when Claude is absent clings prettily to the village medico, it will be foreseen that the ground is prepared for the plentiful crop of lovers’ quarrels which eventually, and naturally, arise. The engagement between Claude and Dora is broken off. The Girton girl, Euphemia, with her up-to-date notions of man, does not, however, go to such extremes, but contents herself with the stipulation that, knowing such “goings on” must happen, they shall be carried out more under the rose. In the third act the ladies are still inexorable in their refusal to believe in the angelic visitor, whose liberal embracings of everything in the shape of man-kind still continue. Some fun is made when the ever-alluring Stella entices the doctor and the vicar to sit one on either side of her, and proceeds to deck their headgear with garlands of roses. Explanations eventually ensue between the lovers, and when the gentle spirit realises all the mischief of which she has been the innocent cause she is freed from a spell which binds her to the earth, has a timely recall to the planet Venus, and all ends with conventional bliss. As Stella, Miss Kate Rorke (who, by the way, in the part, made her first appearance on any stage in conjunction with the Croydon Histrionic Society), is simply charming, and gives a portrayal that is throughout graceful and unaffected. To quote one of the authors, “the part is a divine one,” and it is divinely played. Miss Eva Moore as the Girton girl, Euphemia, gives excellent point and emphasis to her many smart lines, and plays with consistent spirit, and Miss Louise Gourlay lends valuable and artistic assistance as Mrs. Allgood. Mr. Oswald Yorke as the star-gazing Claude Somerville plays naturally and well, and by force of character and commendable energy subdues the glaring improbabilities of the part. Mr. G. W. Anson gives humorous and able treatment to Dr. Middleton, and by his experience alone lends admirable service to the cast. Mr. J. Beauchamp, excellent character actor that he is, makes a splendid little study of the vicar, Dr. Dullamere, and Miss Harriett Jay—suddenly called upon to “deputise” for Miss Vera Beringer—plays exceedingly well as Dora. The comedy was mounted to perfection by the local management, and no stone was left unturned to make the production a success. The incidental music was composed by Mr. Orlando Powell, and the play produced under the direction of the authors. A Happy Pair precedes, and is brightly played by Mr. F. Grove and Miss Emily Grove. on Monday, June 8th, 1896. 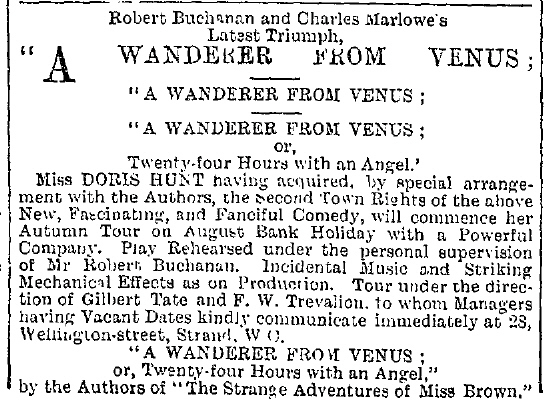 The initial performance of Messrs Robert Buchanan and Charles Marlowe’s latest comedy, The Wanderer from Venus; or, Twenty-four Hours with an Angel, was given before a large audience on Monday last. The play is described by the authors as a “fanciful comedy of modern life,” and the appellation is happily chosen, as a more fanciful comedy it is difficult to imagine. The action of the play takes place at the village of Moonbury, near London, the scenes of acts one and two being laid in Claude Somerville’s apartments, which are presided over by a motherly old matron named Mrs Allgood. Act three takes place in the garden adjoining the house. Claude Somerville is a young man who is given to star-gazing, and whose soul soars to things ethereal and planetary possibilities. His friend, John Middleton, M.D., a rural doctor, is more matter-of-fact, and ridicules Claude’s lofty ideas. The two friends are betrothed to Dora and Euphemia, daughters of Dr. Dullamere, the vicar of Moonbury. Claude is carried away by his star-gazing and dreams of other worlds, and when left to himself, in his enthusiasm he calls upon the planets to send to him one of the beautiful beings his mind has conjured up. His prayer is answered, and a creature of entrancing beauty, robed in light drapery, appears upon the scene. She states that her name is Stella, and that she has winged her way from the planet Venus in answer to Claude’s fervent calls. From this startling commencement the chief incidents in the play proceed. Claude is soon deeply in love with the celestial being, and cannot resist her bewitching power of attraction. Stella, in her innocence, asks many naïf questions regarding doings on mother earth. Her astonishment is unbounded when the differences between the sexes, the marriage laws, and other interesting truths are explained to her. As her knowledge of earthly ways increases, so her mood changes; and in the place of the happy, light-hearted Stella of Venus, with no thought of evil or cares, we soon see the more earthly being with her varying passions, and with her love for Claude, which must not be checked by the thought of a rival. To such an extent does her passion carry her that she does not hesitate to hint that she would not stop at trifles to remove her rival, Dora, from her path. A bitter scene between Claude and Dora is watched by Stella, whose jealous passions are subdued by the grief of the latter. Stella then sees that Dora has a prior claim to Claude; her goodness overcomes her bad feelings, and she renounces her love for him. With the casting away of wicked, worldly thoughts, all her former gentleness returns, and she sees that earth is no place for her. Amidst a scene of reconciliation between Dora and Claude, she wings her way back to her planet home. The serious business is relieved by humorous scenes between Dr. Dullamere, Middleton, and Stella. The latter, not understanding the consternation she causes by her fascinating beauty, makes love indiscriminately to the doctor and the vicar, and a lively scene reaches a climax when Euphemia discovers the three together on a garden seat, the men decorated with flowers, and Stella’s head softly reclining on the vicar’s breast. Dora, Euphemia, and Mrs Allgood also cause amusement by their different ways of showing displeasure and indignation at the conduct of the “angel,” as Claude so aptly denominates his new-found love. The entire action of the play is supposed to take place within twenty-four hours. As Claude Somerville Mr Oswald Yorke had a part which taxed his resources to the utmost, and he came through the ordeal with flying colours. The rôle was a most difficult one to play, but Mr Yorke was equal to the occasion, and gave an impersonation which reached a high level of excellence. Miss Kate Rorke thoroughly identified herself with the rôle of Stella, and in her light, airy costume looked every inch the beautiful celestial being she was intended to represent. She depicted all the varying phases of the character with striking success, and the changes from heavenly love to worldly hate, and from hate to womanly pity for her rival, were given with full power and great charm of manner. Miss Rorke worked the audience up into a state of keen excitement by her fine acting. Mr G. W. Anson was very good as the country doctor John Middleton. As the vicar Dr. Dullamere Mr J. Beauchamp gave an acceptable character sketch. The part was one that could easily have been overdrawn, but it was quite safe in the hands of Mr Beauchamp. Miss Harriett Jay’s part of Dora, although undertaken at short notice, vice Miss Vera Beringer, was commendably sustained, and in the pathetic scenes her emotion was beautifully expressed. Euphemia, the smart Girton girl, was admirably enacted by Miss Eva Moore. Her lines were delivered with a quiet emphasis which was very telling. Miss Louise Gourlay was delightful as Mrs Allgood, and deserves praise for her natural performance of the part. The idea of the comedy can scarcely be called original; it savours too much of Pygmalion and Galatea and Niote, but the dialogue is smartly and well written. The play certainly had a cordial reception, and the authors responded to a genuine and hearty call. The hard-working company was also applauded. Delightful incidental music was composed by Mr Orlando Powell, magnificent scenery was specially painted for the production, and the proprietors of the theatre (Messrs Batley and Linfoot) and manager (Mr Tom Craven) may be congratulated upon the completeness with which the comedy was mounted. The comedietta A Happy Pair, which preceded, was irreproachably played by Miss Emily Grove and Mr F. Grove. MISS VERA BERINGER was originally engaged for the part of Dora in Mr Buchanan’s play The Wanderer from Venus, but a minute or two before the curtain rose it was announced that she would be “unable” to appear, and that Miss Harriett Jay would replace her. As one or two portentous paragraphs have been penned, it should be stated that the rearrangement was made in perfect amity among all the parties. SO satisfied are the authors of The Wanderer from Venus with the results of its initial week at the New Grand Theatre, Croydon, that they have determined to send it on tour at once, with all the new scenery and effects, prior to its London production. In view of the large expense involved in the cast and in the production generally, only first-class towns can be visited, but a No. 2 company will be organised later on to visit the smaller theatres. A FANCIFUL comedy by Mr. Robert Buchanan and “Mr. Charles Marlowe” has this week enjoyed a trial trip at the new and handsome Grand Theatre in Croydon and was evidently much enjoyed by its audience. As might perhaps have been guessed from its title, The Wanderer from Venus; or Twenty-four Hours with an Angel, the motive of the piece is distinctly akin to those of Pygmalion and Galatea and Niobe. A star-gazing lover while staring speculatively into the heavens invokes the descent of Venus, and his prayer is answered by the arrival on the scene of an angel named Stella attired somewhat after the meagre fashion affected by the angelic host according to our illustration of supernatural fiction. Of course Stella falls in love, and equally of course she angelically thinks it quite unnecessary to conceal her feelings, the result being that she upsets various mundane rivals extremely before she returns to her native sphere. The sentiment of the prettily written but rather trite romance is perhaps fresher than its humour; but both will be found most effective by those play goers who know neither Gilbert nor Paulton. Of the pleasant performance the chief feature was supplied by Miss Kate Rorke, who made a singularly charming angel with many dainty traits of feminine humanity. Miss Harriett Jay took the place which was to have been filled by Miss Vera Beringer as Stella’s chief rival, and of course knew exactly the authors’ intention in the rôle. Mr. Oswald Yorke played the rather thankless part of the lover satisfactorily, and a thoroughly adequate cast included also Mr. G. Anson and Miss Eva Moore. The Croydon audience was large, and, as we have said, found The Wanderer from Venus a fairy-play to be thoroughly enjoyed. The Wanderer from Venus was produced at the pretty new theatre at Croydon last Monday night. No one seemed to have a particularly definite idea of the meaning of the title, because, as a rule, men wander to Venus and not from her. The play, written by Messrs. Robert Buchanan and “Charles Marlowe,” however, speedily developed itself into a sort of hash-up of Pygmalian and Niobe mixed. A young party comes down from the stars to spoon with a spoony astronomer, already engaged to the daughter of the Vicar of his parish. Of course there are mistakes, and ructions in consequence, and in the end the young party is sent back to headquarters again. Miss Kate Rorke made a lovely Stella, but her talents were wasted. The piece can have little chance of living. The first act is terribly dull and preachy, and though there are one or two intervals of fun, the whole play leaves upon the mind an impression of dulness. CROYDON has not yet been incorporated with London, and consequently the production at Mr. Tom Craven’s handsome new theatre situated there of a new play hardly comes within the scope of our metropolitan notices. A word, nevertheless, may be spared to The Wanderer from Venus, first performed at the Grand, Croydon, on June 8, inasmuch as the piece bears the sign-manual of two writers so well known as Mr. Robert Buchanan and “Charles Marlowe.” Not that, we fear, their new “fanciful comedy” is likely to add greatly to the fame of either, particularly as the ground it covers is already occupied, and occupied, we are constrained to say, to much better purpose. Had Pygmalion and Galatea never been written, one might be disposed to recognise in The Wanderer from Venus a certain measure of novelty. Unfortunately, as matters stand, we can only see in it a comparatively ineffective version of Mr. Gilbert’s brilliant work. And from this view even the efforts of a company including among its numbers Miss Kate Rorke, Miss Eva Moore, Miss Harriett Jay, Mr. G. W. Anson, and Mr. John Beauchamp have failed to convert us. The Wanderer from Venus; or, Twenty-four Hours with an Angel: a new and original fanciful comedy. By Robert Buchanan and Charles Marlowe. New Grand Theatre, Croydon, 8 June, 1896. I note with satisfaction that the suburban theatre has now advanced another step. On Monday a new play by Mr. Robert Buchanan and his collaborator, “Charles Marlowe,” was produced at the new theatre at Croydon—a theatre which is to some of our Strand theatres as a Pullman drawing-room car is to an old second-class carriage—with a company which includes Miss Kate Rorke, Mr. Oswald Yorke, Mr. Beauchamp, Mr. Anson, Miss Eva Moore, and Miss Vera Beringer. The band played the inevitable overture to “Raymond” and Mr. German’s dances, for all the world as if we were at the Vaudeville. I paid three shillings for a stall, and two-pence for a programme. Add to this the price of a first-class return ticket from London, three and sixpence (and you are under no compulsion to travel first class if second or third will satisfy your sense of dignity), and the visit to the Croydon Theatre costs three and tenpence less than the bare price of a stall in the Strand. And as Miss Kate Rorke not only plays the part of an angel in her most touching manner, but flies bodily up to heaven at the end of the play, to the intense astonishment of the most hardened playgoers, there is something sensational to talk about afterwards. The play is a variation on the Pygmalion and Galatea theme. It is full of commonplace ready-made phrases to which Mr. Buchanan could easily have given distinction and felicity if he were not absolutely the laziest and most perfunctory workman in the entire universe, save only when he is writing letters to the papers, rehabilitating Satan, or committing literary assault and battery on somebody whose works he has not read. I cannot help suspecting that even the trouble of finding the familiar subject was saved him by a chance glimpse of some review of Mr. Wells’ last story but one. Yet the play holds your attention and makes you believe in it: the born storyteller’s imagination is in it unmistakably, and saves it from the just retribution provoked by the author’s lack of a good craftsman’s conscience. Messrs. Buchanan and “Charles Marlowe’s” play, “The Wanderer from Venus,” is a very reminiscent production, recalling whole pages of “Pygmalion and Galatea,” and of “Niobe,” as well as of Mr. Wells’ delightfully clever and witty book, “The Wonderful Visit.” Mr. Buchanan’s “Pygmalion” is an amateur astronomer engaged to marry a daughter of one of the typical mundane parsons of the modern stage. To him arrives, in answer to a pre-fervid invocation, an angel from the planet Venus, in the guise of Miss Kate Rorke—a charming actress—a lovely woman, but a very substantial angel. She immediately proceeds to fall in love with the star-gazer, with all the innocence and inexperience of a Galatea. Complications arise through the unbelief of neighbours and fiancée, in the celestial character of the visitor. The chief sceptic is the doctor of the village (like Dr. Crump in “The Wonderful Visit.”) This part was admirably played by Mr. Anson. Of course, when the disenchanted “Wanderer” understands the mischief she has caused, she reascends conveniently to her native planet, and human affairs resume their normal course. On the fall of the curtain Mr. Buchanan and his collaborateur, Miss Harriett Jay (who writes under the name of “Charles Marlowe”) responded to the call for “Author,” but made no attempt to address the friendly, though not very enthusiastic, audience. THE DRAMA AND THE STAGE. 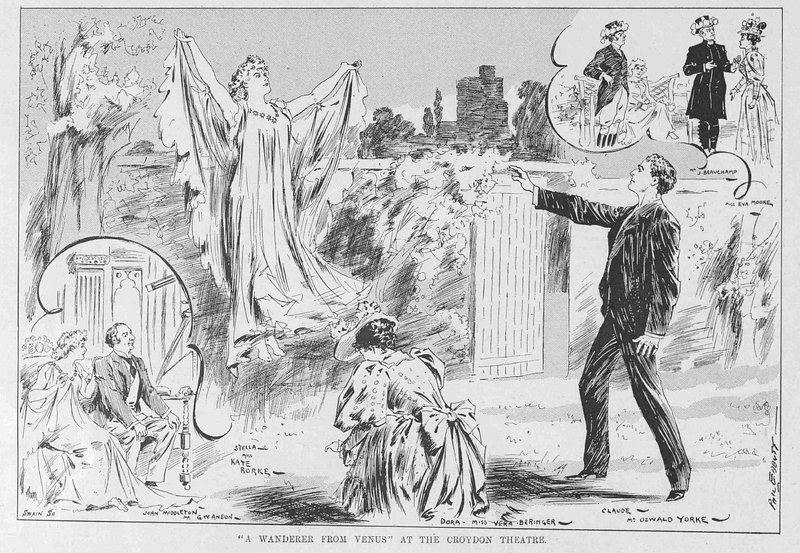 More of the light and amusing fare which is so increasingly popular amongst theatre-goers is provided this week at the Darlington Theatre Royal in the engagement of Miss Doris Hunt’s company in “The Wanderer from Venus.” This is the first time the piece has been produced out of London, where this original, fanciful comedy has won golden opinions. The company includes Miss Doris Hunt as “The Wanderer from Venus,” and Mr L. Cory Thomas, who will be remembered with pleasure as one of the officers in “Bootles’ Baby” when in Darlington. “A WANDERER FROM VENUS” AT THE THEATRE ROYAL.—When such experienced collaborators as Robert Buchanan and Charles Marlowe hit upon so whimsical an idea as that which has given birth to “The Wanderer from Venus,” one naturally looks for a play combining literary merit with the power to amuse. And in the piece this week being performed at the Theatre Royal we are not disappointed. Claude Somerville is a dreaming astronomer who likes nothing so well as communing with other worlds during the darkest hours of the night. He meditates much upon the nature of the inhabitants of the planets (never doubting that they are peopled) and, apostrophizing Venus, he pleads for visible confirmation of his theories. His prayer is answered, and “Stella” descends from the luminous orb to the dark and dreary earth. Then the trouble commences; the lady, “an angel,” Somerville calls her, is but lightly clad, and her diaphanous drapery would occasion remark, even if the fact of her strange presence in a bachelor’s apartments failed to excite comment. But Somerville is engaged to the Vicar’s daughter “Dora,” and his friend Dr. Middleton stands in a similar relation to Dora’s sister, “Euphemia,” a strong-minded woman of advanced education; in short, a Girton girl. The complications which ensue when Stella (who proves an apt pupil in the material conditions of the Earth, and experiences the sensation of human love), is discovered in tender situations with Somerville and Middleton by their respective sweethearts, are extremely diverting. The clever authors have contrived to put all the male characters, even the good old vicar, who feels it his duty to “talk seriously” to the “young person,” into compromising situations, and matters are only cleared up when Stella reveals a really angelic quality, and, renouncing her earthly love for Somerville, wings her way back to her own bright particular star. Miss Doris Hunt is very captivating as “Stella.” Bewilderment in her first acquaintance with the planet Earth is excellently conveyed, and then the transition from a state of amazed wonderment at, to enjoyment of, earthly pleasures is extremely naturally done, and gives evidence not only of intelligent appreciation of the character, but of ability to portray it. In the part of “Euphemia,” Miss Ethel Gordon makes every point tell, and she is mainly responsible for the most amusing quarter of an hour in the play, when she discovers her fiancé with the “angel’s” arms around his neck. Throughout the piece she delivers the incisive sayings of a woman of the “higher” education with penetrating emphasis, and even her father does not escape the lashings of her bitter tongue. If she be a true stamp of the Girton girl, we hope it will never be our direful destiny to live with so dogmatic a damsel, rather would we be at once translated to Venus, and dwell with amiable angels such as Stella. Miss Gordon must, nevertheless, be highly complimented on her admirable delineation of the character. As “Dora” the more gentle of the sisters, Miss Lucy Sibley is pleasing, and Miss Gertrude Le Sage, as Somerville’s astonished housekeeper, never misses a point, and elicits many a laugh. Mr. Graham Browne has a difficult rôle in that of the astronomer, and the clever manner in which he plays the character adds to his reputation as an earnest and conscientious actor of marked ability. Mr. A. B. Murray gives a good representation of a country doctor, and he is particularly diverting in the scene with “Euphemia,” when he is receiving his “roasting.” Mr. L. Cory-Thomas acts carefully and well as the “Vicar.” The play is preceded by a comedietta, “A Case for Eviction,” in which Mr. G. G. Kingsland, Miss Sibley, and Miss Le Sage show to advantage. A SYNDICATE has bought the rights to The Kiss of Delilah, for production after the pantomime season. Mr Robert Buchanan was so impressed by Miss Edith Jordan’s performance of Estelle Beaupas that he immediately engaged her to sustain the leading character in A Wanderer from Venus at the Lyceum, Edinburgh, on Monday. A considerable proportion of the audience at the Royalty last night were doubtless drawn to the theatre by the title of the piece which was performed—“The Wanderer from Venus.” Another attraction was probably the fact that it is partly the work of Mr Robert Buchanan, poet, dramatist, and novelist. 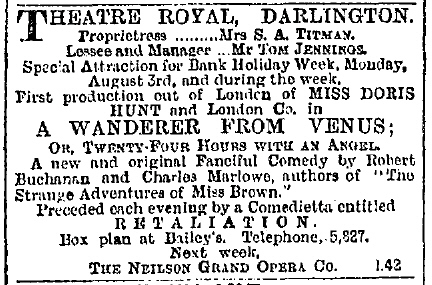 As in some others of his stage productions he has had in this instance also the co-operation of Miss Harriett Jay. Of the two sources of attraction we are inclined to think that the name selected for the comedy was the more potent. Mr Buchanan as a playwright has not always been an unqualified success. Neither is he in this, the latest of his essays, as a dramatic author. Over-seriousness is his besetting fault. To him the stage has evidently a mission—namely, to lift us all above base and conventional ideas of human life. If there is one quality more conspicuous than another in Mr Buchanan it is individuality. It asserts itself in all his work, nowhere more so than in his productions for the theatre. In “The Wanderer from Venus” his originality is scarcely so much as usual in evidence. The idea of the comedy is by no means new. In the school books for juveniles there used to be an interesting poem entitled “How it strikes a strange.” It was the story of the impressions of a celestial visitant to the earth—how he was rejoiced with the joyousness of nature, and saddened by the spectacle of decay and death. The idea has been turned to comedy by the skilful pen of Mr W. S. Gilbert, whose Galatea is not yet in danger of being surpassed for boldness of conception or brilliance of expression. Such poetic and mythological fancies have probably suggested to Mr Buchanan an expansion of the same idea. In response to the rapturous apostrophes of a love-sick youth, addressed to the starry firmament, he brings to this terrestrial globe an inhabitant of the planet Venus. This vision of loveliness, clad in airy robes, is made to walk the cold, dull earth barefooted, as if she were a sort of celestial Trilby. She is like the gay grisette of the Latin Quarter in another respect—she turns the heads of all the men she meets. She is presented by the youth, at whose invocation she has come from aloft, to his landlady, to his fiancée and her father, the vicar of the parish, and to his intimate friend, a Scotch doctor, as an angel from heaven. As the newcomer arrives late at night, and is accommodated in the young man’s rooms until the morning, his friends, not unnaturally, take a somewhat more prosaic view of the situation, and it is in this connection that the best comedy of the piece is introduced. A young lady who has learned philosophy at Girton, and has not been unobservant of the ways of the world, has some piquant remarks to make about men and angels in the abstract, and even the doctor and the clergyman discover that after all there may be more things in heaven and earth than even they have dreamed of. Of course, the visitor soon adapts herself to her environment, and begins like ordinary mortals to indulge in material sustenance. Then the passions of love, jealousy, and hate take possession of her for a while, and, finally, when she realises that the world and the things thereof are not worth the trouble they bring, she is hoisted back to Venus by means of a wire worked from the flies, and leaves the poor humans whose peace and happiness she has temporarily upset to resume the thread of their everyday existence. As a somewhat eccentric example of comedy the piece is interesting after a manner, but the passages, and there are several, in which the authors rise into the region of ethics are, truth to tell, a little tedious, and not at all convincing. The comedy was capably acted. Miss Edith Jordan had the sympathy of the audience entirely with her in her heroic, and, on the whole, distinctly successful effort to give dramatic embodiment to an extremely fanciful creation. The other parts were also well played by Mr Acton Bond, Mr George Traill, Mr Robson Paige, Miss Florence Tanner, Miss Lucy Sibley, and Miss Marie Anderson. ROYALTY THEATRE.—Lessees, Messrs Howard and Wyndham, Limited; Acting-Manager, Mr Frank Sephton.—The first performance in the provinces of The Wanderer from Venus, by Robert Buchanan and Charles Marlowe, was given here on Monday. The play is one of the many dealing with miraculous or supernatural visitations, of which W. S. Gilbert’s Pygmalion and Galatea is the best known and most satisfactory. The present production has all the advantages of Mr Buchanan’s poetic temperament and imagination, and is clothed in really beautiful language, the graceful and flowing blank verse of the two principal characters, the romantic star-gazer Claude Somerville and the mysterious Stella, contrasting well with the modern up-to-date prose of the other parts. The idea forming the basis of the play is good, that of an idealistic astronomer, strong in the belief of there being other inhabited worlds, hoping and praying for proof, and his wish being answered by the descent of the dainty wanderer from the planet Venus, whose advent flutter the dovecotes of the little village of Moonbury, and sets the various characters by the ears, for a time, at least. In the working out, however, the authors have allowed themselves to waver between the fanciful and the farcical, and the combination does not make a good blend. The ethereal Stella, who seems at first a being utterly removed from earthly weaknesses, speedily develops a human selfishness and tawdry jealousy that go far to estrange sympathy from the character, and the final scene, in which the wanderer elects to return to her native Venus, in place of being the outcome of some grand development of love, pity, or even jealousy, suggests nothing but female caprice of a very human description. Miss Edith Jordan as Stella acted throughout in graceful and sympathetic style, and spoke her lines with feeling and rhythmical charm. Mr Acton Bond was an effective and duly romantic Claude Somerville. Miss Florence Tanner as Dora, the lady whose happiness is so nearly blighted by the planetary visitor, looked and acted well, rising to the occasion in the scene in the third act with her lover and his “angel.” As the matter-of-fact Scotch doctor and his equally prosaic intended Mr George Traill and Miss Lucy Sibley were of decided value, and Mr Robson Paige as a prosy and earthly-minded parson was amusing without any tendency to over emphasise the part. Miss Marie Anderson was an attractive and effective housekeeper. The play was preceded by a comedietta, Down East, in which Miss Constance Wallis and Miss Helen Farrington worked hard to amuse. LYCEUM THEATRE.—Proprietors, Messrs Howard and Wyndham (Limited); Acting Manager, Mr A. Weston.—Messrs Robert Buchanan and Charles Marlowe’s new and original farcical comedy The Wanderer from Venus was presented here on Monday evening, but did not draw a large house. The comedy was effectively mounted and admirably acted. Mr Acton Bond bore himself bravely as the romantic star-gazer, Claude Somerville, and acted with his accustomed ability and success. Mr George Traill emphasised the character of Dr. Middleton with no little skill, and Mr Robson Paige gave a broadly humorous rendering of the Vicar, Dr. Dullamore. Miss Edith Jordan’s performance of Stella was deserving of the highest praise, and Miss Marie Anderson made an excellent Mrs Allgood. Dora was charmingly personated by Miss Florence Tanner, and Miss Lucy Sibley did her best with the rôle of the masculine and too outspoken Dora. Reply Paid preceded.